The same motivation is true for millions of overseas Filipino workers (OFW). 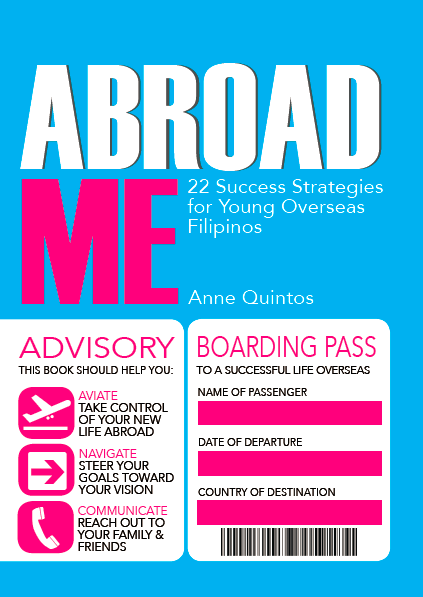 But for Anne Quintos, author of Abroad Me: 22 Success Strategies for Young Overseas Filipinos, OFWs owe themselves the right answer for their choice to uproot themselves from home. This will be the topic of her talk during the book launch of Abroad Me on October 11 (Saturday), 5:30 p.m., at Fully Booked BGC branch. More information on the official book website (http://www.abroadme.com.ph) and the publisher's website (http://www.pagejumped.com).